800 is a number. Eight-hundred is a word. Words? Numbers? What is that all about? Have there always been words? Numbers? I think not. There was a time when there were no numbers or words. A time when we were just here… and not talking about it. During those times, we lived in small groups. Everyone in each group knew what everyone else was thinking, knew where everyone had been, and had a good idea of where everyone was going. Then, as small groups grew, it became difficult to know everyone, much less what they were thinking, or where they were at any given time, not to mention where they had come from or what they had done. Then there was the history issue. I don’t mean the musty recording of who did what to whom. I mean the know this or die kind of history: like where the bad animals lived, the location of tar pits and quick sand, and the ways of the humans who lived just over that ridge, the ones who seemed to delight in killing members of other bands. Words became necessary if humans were to survive on earth. They were essential for communicating our history, our ideas, our plans, everything. And what of numbers? They are required to add dimension to language by specifying time, magnitude and size. For example, if you and I were having a conversation and I said, “Words,” that would be meaningless, until I added at least one number, say 800. So, if I said 800 words, you’d know the exact number of words I was talking about, though, unless you’re a writer, you probably don’t know what 800 words looks like. To give you a reference point, this is word number 305 in this post; or slightly over 38% of 800. The piece still has a way to go to hit 800. For me, 1,000 words has always been a benchmark of sorts. It separates the recording of an idle thought from something more serious, even if the 1,000 is only the bare beginning of a string that will ultimately be 50,000 – 75,000 words; an acceptable novel length today. When I was searching for entertainment and saw 800 Words, the title of a Acorn series, I was interested. I knew what it was about. At least, I knew part of it. I knew there would be a writer, charged with stringing together 800 words for a definite purpose. That’s all I had to know to continue exploring the story line. This is the description of the show that I found on IMDb: A recently widowed father, quits his job as a popular 800-word columnist for a top selling Sydney newspaper. Over the internet, he buys a house on an impulse in a remote New Zealand seaside town. He then has to break the news to his two teenage kids who just lost their mum, and now face an even more uncertain future. But the colourful and inquisitive locals ensure his dream of a fresh start does not go to plan. Another click and I discovered that last month (Jan 2017), the producers of the show announced that it had been renewed for a third season. The description, the two-season run and the renewal were more than enough for us to take a chance. That was four days and four episodes ago. Yep, we’re hooked. If this were simply a review of a TV show, this is the place where I would say, “Good writing, good characters, great acting, fantastic location, entertaining, etc. etc.” and I would end by saying, “Watch it, you’ll like it.” I would include a link - Like this. Currently she is working on a collection short stories that are marvelous. The key word in that sentence is working. She labors over each word as a great artist focuses on every brush stroke. The effort expended is evident in the results. Though I didn’t comment on her comment, it hit home. I knew what she said was true, and I knew I’d been very lax with my writing – note, that comment translates: I’ve not written a word for a while. 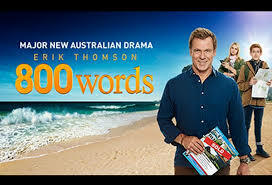 So, my brain immediately connected the conversation with the show, 800 Words, and added this thought, I can write 800 words. I can do that every day. No matter how busy I am, or think I am, I can write 800 words. And then I thought, I’ll do it.